A unique and interesting two day workshop was held recently at MET. 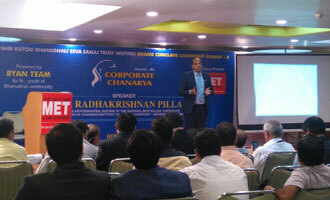 This workshop known as ‘Chanakya’s 7 Pillars for Success in Business Principles’; was conducted by Dr. Radhakrishnan Pillai, fondly known as Chanakya Pillai. He has been conferred with the ‘Sardar Patel National Award ’09 for the research on Chanakya and his principles, a management trainer, consultant and guide to his clients.